The story of Abdul "Duke" Fakir, the Four Tops, and vintage music videos of their biggest hits: Baby, I Need Your Loving; I Can't Help Myself (Sugar Pie Honey Bunch); It's the Same Old Song; Reach Out (I'll Be There), Standing in the Shadows of Love, Ain't No Woman (Like the One I've Got), When She Was My Girl. Octogenarian senior citizen and co-founding member of 60's Motown group the Four Tops Abdul "Duke" Fakir was born on December 26, 1935 and turns 81 today in 2016. Born and raised in Detroit, Michigan by parents of Ethiopian and Bangladeshi heritage, Duke Fakir has lived his entire live in the Detroit area. He told freelance writer Malcolm Wyatt in April 2016 that due to their large families in Detroit, the Four Tops opted to stay in Detroit instead of moving to Los Angeles in 1972 when their Motown label moved there. Duke Fakir has said he grew up singing jazz and gospel music in church and choirs in Detroit. While attending Detroit's Pershing High School, he met baritone singer Levi Stubbs (a cousin of singer Jackie Wilson). As Fakir tells it, "When I met Levi and we first started singing together, way back before we started The Four Tops, I just knew he had an incredible voice. He was destined to be lead singer, whether it was going to be all by himself or whatever. Levi actually moved in with me. I was an athlete and I played on the basketball and football teams, and Levi would ride the bus with me going to the game with these team players." Duke Fakir told The Quietus that both he and Obie Benson had received scholarships to go to the same college, but their first professional singing gig that summer changed their career path. The Four Aims became popular local recording and performing artists. In 1956 they signed with Chess Records and changed their name to the Four Tops. For the next ten years the Four Tops toured across the United States, playing clubs in New York and Las Vegas, and honing their R&B and soul music sound. Success began to come their way after the Four Tops signed with Motown records and Berry Gordy in 1963. After initially singing back-up for The Supremes and Martha and the Vandellas, the Motown songwriting team of Holland-Dozier-Holland (Lamont Dozier, Brian Holland, Eddie Holland) began writing songs for the Four Tops. As Duke Fakir tells of their Motown experience, "It was lifechanging, immediately. Our first record release, ‘Baby I Need Your Loving’, it just took our breath away." Baby I Need Your Loving was a #4 R&B, and #11 US chart hit for the Four Tops in 1964 courtesy of baby boomers, and was their first hit single written and produced by Holland–Dozier–Holland. Below, The Four Tops singing Baby I Need Your Loving circa 1964 on Hollywood A Go Go. Written and produced by Holland–Dozier–Holland, I Can't Help Myself (Sugar Pie Honey Bunch) was recorded by the Four Tops and released in June 1965. I Can't Help Myself (Sugar Pie Honey Bunch) (1965) was their first #1 US and R&B chart hit. 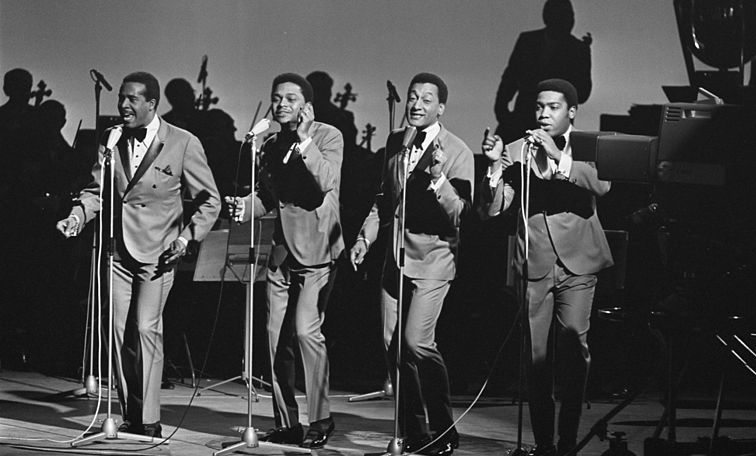 Below, lead vocals by Levi Stubbs, with Abdul Duke Fakir (in glasses) and the other Four Tops singing backup, in a 1960s performance of I Can't Help Myself (Sugar Pie Honey Bunch). At Berry Gordy's insistence, It's the Same Old Song (1965) was written and produced by Holland–Dozier–Holland, recorded by the Four Tops, and released - all within 24 hours. Gordy wanted to counter a re-release of the Four Tops single Ain't That Love by the group's previous label, Columbia Records. Below, the Four Tops sing It's the Same Old Song live in 1966. Baby boomers loved it and It's the Same Old Song made it to #5 in the US, and #2 on the R&B charts. Reach Out I'll Be There (1966), written and produced by Holland–Dozier–Holland, has become the signature song for the Four Tops. Reach Out I'll Be There became a #1 hit on the US, UK, and R&B charts, and was inducted in to the Grammy Hall of Fame in 1998. Below, Levi Stubbs, with Duke Fakir and the Four Tops singing Reach Out I'll Be There live in 1966/67. Standing in the Shadows of Love (1966) was a #6 US and UK, #2 R&B. hit for the Four Tops. Written and produced by Holland–Dozier–Holland, Standing in the Shadows of Love has been criticized for it's similarity to both the Four Tops previous hit single, Reach Out I'll Be There, and The Supreme's Standing at the Crossroads of Love. Bernadette (1967) was recorded in the Hitsville U.S.A. Studio A and released in February 1967. Written by Holland-Dozier-Holland, Bernadette was their last Top Ten US hit of the 1960's, making it to #4 US and #3 R&B. When Bernadette was re-released in 1972, it made it to #23 in the UK. It would be the last big hit single for the Four Tops written by Holland-Dozier-Holland, as the songwriting team left Motown in 1967 due to royalty and other disputes. For a while Duke Fakir was linked in a romantic relationship with Mary Wilson of the Supremes; keeping it in the Four Tops family, Obie Benson was linked with The Supreme's Florence Ballard. At Florence Ballard's 1976 funeral, the Four Tops - Duke Fakir, Obie Benson, Levi Stubbs and Lawrence Payton - were among her pallbearers. Mary Wilson and Duke Fakir have remained friends and sang Christmas songs together in 2013 in the Mary Wilson Holiday Spectacular stage show. Ain't No Woman (Like the One I've Got) (1973) features each member of the Four Tops taking a turn singing lead in the chorus, beginning with Levis Stubbs, and ending with Abdul "Duke" Fakir. Written by Dennis Lambert and Brian Potter, Ain't No Woman (Like the One I've Got) was released in January 1973 and climbed up the charts to #4 US, and #2 R&B. Below, the Four Tops performing Ain't No Woman (Like the One I've Got) live on Soul Train in the early 1970s. The Four Tops continued recording, touring, and performing together during the 1960's and 1970's. They have continued to tour frequently in the 80's and beyond, and have always been very popular in the UK. When She Was My Girl (1981) was written by Larry Gottlieb and Marc Blatte and was the Four Tops first release off their new label Casablanca Records. When She Was My Girl was nominated for a Grammy for best R&B song. Below, The Four Tops singing their 1981 disco hit single When She Was My Girl (#11 US, #1 R&B and #3 in the UK), live. The Four Tops performed the song Back to School again with the cast of Grease 2, which was included in the movie's soundtrack. A 50+ Duke Fakir and the rest of the Four Tops had a narrow escape in 1988 when they missed their pre-Christmas Pan Am Flight 103 to return to the U.S. from the U.K. They were delayed in the U.K. in order to complete filming Top of the Pops; fortunate for them, as the plane they were meant to be on carried a terrorist bomb and crashed in Lockerbie, Scotland. The Four Tops were inducted into the Rock and Roll Hall of Fame in 1990, and the original 4 members of the Four Tops continued performing together until Lawrence Payton's death from liver cancer in June 1997, approaching 44 years as an unchanged group. The 3 remaining members - Abdul "Duke" Fakir, Renaldo ‘Obie’ Benson, and Levi Stubbs - performed for a while as a trio under the name The Tops. Eventually singer Theo Peoples, who had sung backup with the group before and had been with The Temptations, joined as the new 4th member of the Four Tops. In 2000 lead singer Levi Stubbs had a stroke (he died in October 2008), and Theo Peoples became the lead singer for the Four Tops. New backup singer Ronnie McNeir joined senior citizen Duke Fakir and Obie Benson as the 4th member of the group. Five years later, septuagenarian senior Duke Fakir became the only remaining original member of the Four Tops when Obie Benson died of lung cancer in 2005. Lawrence Payton's son Roquel Payton replaced Benson as a backup singer, and the Four Tops continued performing. Lead singer Theo Peoples was replaced by Harold ‘Spike’ Bonhart in 2011. "I was born to do this. At my age you would think travelling as much as I do would drive me up the wall, but no! I’m always anticipating where I’m going, what I’m doing next. I get on the plane and I say ‘phew!’ because the phone doesn’t ring, and I can read a book, watch a movie, I can just take a nap. And when I get where I’m going, that becomes the best part of my day because I’m about to do the thing that I love the most. It can be the smallest city in the states or it could be the largest venue in the world – I’m still excited and I anticipate that evening. It’s great to still have passion for what I do. I think that that’s a blessing. The moment I do not have passion, or the moment that people start looking at us and saying ‘you’ve been here a few times, we’re a little bit tired, why don’t you go home and sit on the couch’, if I start feeling that I’d had enough I would, but I haven’t." Duke Fakir marked six decades as a performed in 2014 and continues to tour with the Four Tops. Most recently the new Four Tops lineup of Spike Bonhart, octogenarian senior citizen Duke Fakir, Roquel Payton, and Ronnie McNeir toured in the U.S. and the U.K. Happy 81st Birthday, Duke Fakir!